Would you like to have a lot of victories in battle or cause a lot of damage to your opponent? 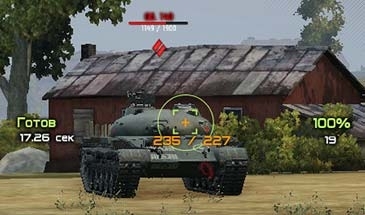 If yes then sight like maracas for World of Tanks 0.9.19.1.1 is for you. As you already know Maracasi released assembly modpacks that are quite popular and also it is one of the best video maker. His video really learn and help you be the best in the game. But today I present you a sight like Maracasi for World of Tanks 0.9.19.1.1 The sight author is Andre_V. This sight is minimalistic in design but very functional in practice. The sight is equipped with a armor calculator that will help you successfully shoot at your enemy, inflicting maximum damage, practically matched the colors are good will be seen on maps, recharging is painted in red and you will be noticeably recharged or not,also sight can be adjusted directly in the game. Copy the folders gui and scripts in WOT / res_mods / 0.9.19.1.1/, confirming a replacement.